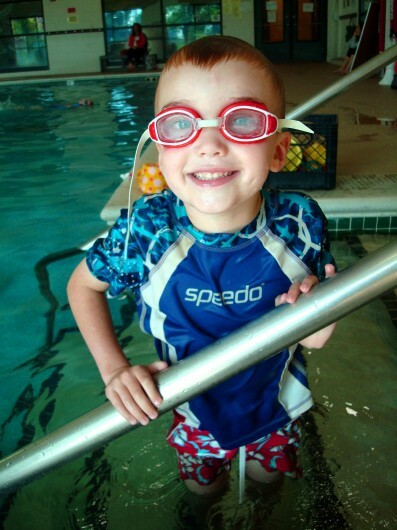 We found out recently, through trips to Great Wolf Lodge and other public pools, that Oliver loves the water. LOVES IT! He can't wait to dive down into it with his face. He now does the same thing in the bathtub. The boy is a little water bug. So, it was obvious that we needed to sign him up for swimming lessons. Yesterday he started lessons at the YMCA and while he was afraid to go to the lessons at first, once he was in the water it was all over. He was sold. He jumped in, splashed, did the back float, and basically swam with assistance all over that pool. He's a natural. Yay! Finally someone in the family like me that loves swimming!